I admit it, I am biased. Nevertheless, when The Rolling Stones announced a North American Tour I really thought it just might be ridiculous to see them. Fortunately, I did not heed my own advice. My seats were up in the third deck, so although it was difficult to make out the action on the stage without watching the monitors - the sound was superb. There is simply no way to know that the performers that I was watching were nearing 70 years old. It is simply unfathomable. The setlist was great. I thoroughly enjoyed hearing the two new tunes, One More Shot and Doom and Gloom. Tonight's special guest was Taj Mahal and he sang a duet with Mick on Six Days on the Road. Emotional Rescue was amazing. I have always liked the song - and actually seeing Mick sing in the falsetto voice was somehow mesmerizing. It was fun how the crowd went wild to some of the great hits, that I have seen time and again. I kept thinking that for the many thousands of people who might be seeing The Rolling Stones for the first time - they would have to be impressed. 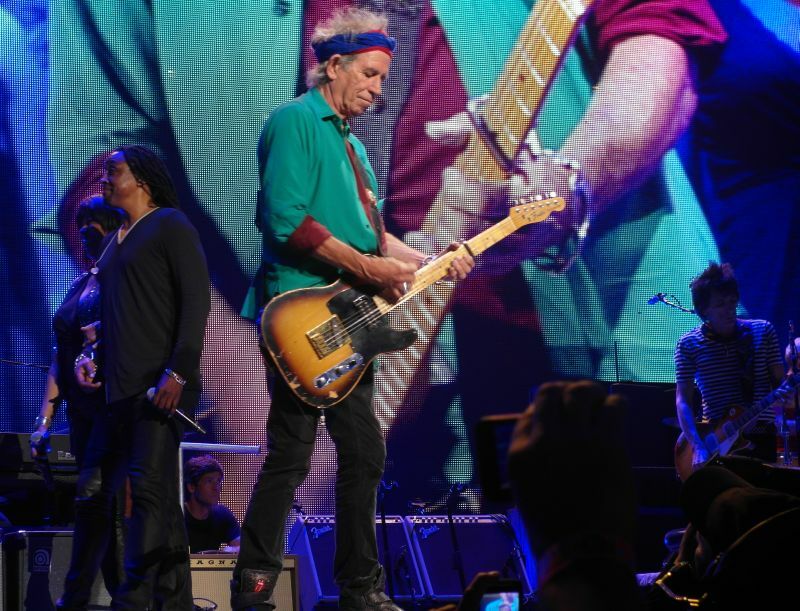 It is not possible for another concert by any other performer to be better - because no matter how good they might be - they ain's singing Rolling Stones songs. During the encore Mick was going nuts belting out lyrics to Satisfaction, and I saw Keith grinning from ear to ear watching him, as by this time I had made my way to the floor area. Regarding tickets to this show. It was really weird that so many tickets were available right up to and even past the scheduled showtime. I guess this is the upside of asking crazy high prices. When I was a kid, one had to scheme and plot and plan to secure tickets - whether one was camping out at the box office, or trying to win a lottery. Back the the prices matched the demand. My first Stones concert in 1975 at Madison Square Garden set me back $12.50 (and even then, they were expensive, as I had seen Led Zeppelin earlier that same year for $6.50) My point is one felt lucky to get tickets at any price. With prices $300 and $600 - getting tickets was not so much a matter of luck. I don't think that I would have enjoyed the show quite as much if I had paid $600 - but I did pay $150.00 at 8:07PM at the United Center Box Office and I did feel lucky and grateful. The Rolling Stones are and always have been the World's Greatest Rock and Roll Band. I am so lucky that I have enjoyed their music for the last 40 years. That they have been around for 50 years is beyond amazing. And you know what? They still got it! Fantastic! 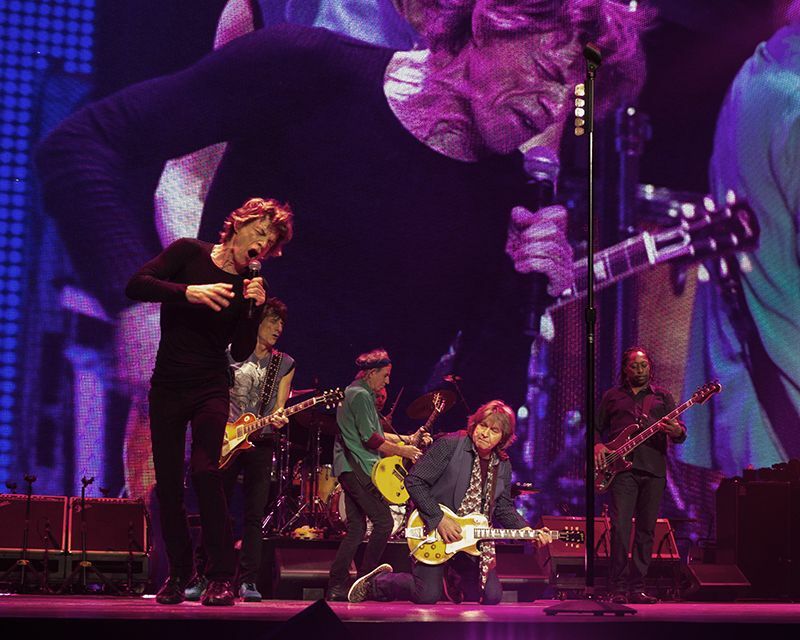 From the opening video to the bow at the end, the Stones put on an energy-filled show. The opening video is hilarious. It's fun to hear the average fan as well as stars of movies and music share memories of life events related to Rolling Stones songs. Very cool opening for such a momentous anniversary tour. Emotional Rescue was great to hear. Mick sang the high notes with enthusiasm then changed it up for later verses. We have been to many, many Rolling Stones shows, and tonight was the first time we've heard that song live. Special guest Taj Mahal gave us Six Days on the Road. Everyone on stage was having a blast, and it was clear that Taj could have kept jamming for hours. Glad to see a real musician as a special guest. Doom and Gloom and One More Shot were well received. But Midnight Rambler really stood out. 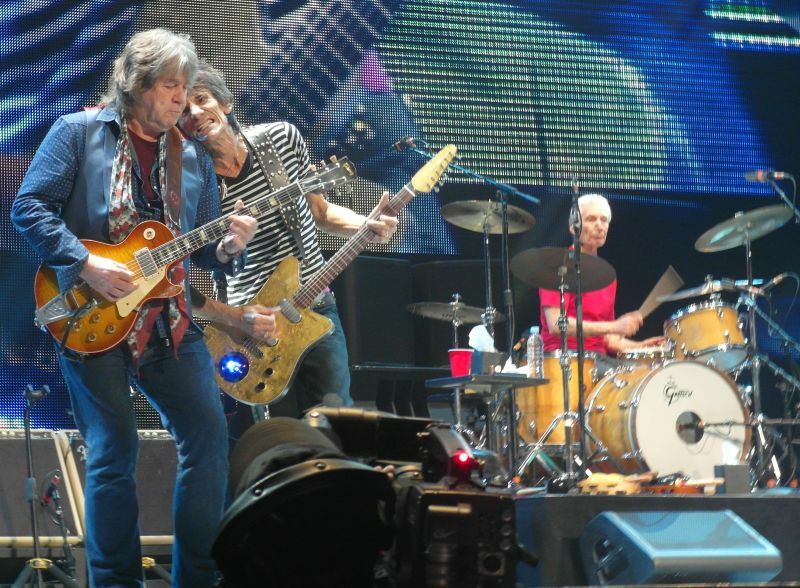 It was great to see Mick Taylor up there. Despite a lack of chemistry, Midnight Rambler worked the crowd into a frenzy. Then all the old standards. Everyone loves them, so they continue to be played. Wish it would be mixed up more, but you can't always get what you want. Speaking of You Can't Always Get What You Want, the crowd was cheering for more and more before this first encore. The choir from Roosevelt University assembled on stage along with a French horn player, and the crowd was in such a frenzy that it was difficult to hear the choir as it began this special treat. What a thrill for those choir members! Fantastic is all we can say. 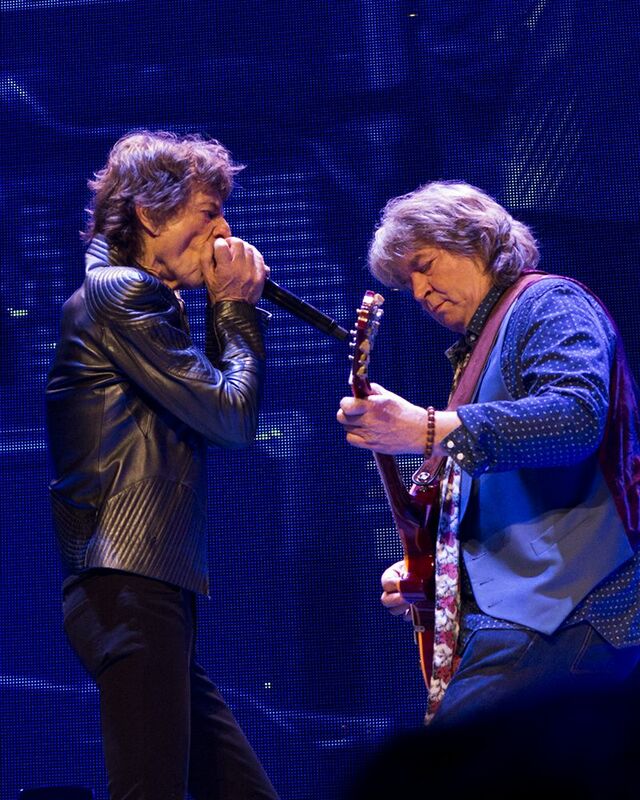 Mick Taylor returned to the stage for the final encore, Satisfaction. It was strange, but he chose to sit cross-legged on the stage while everyone else was running around and connecting with every section of the United Center. 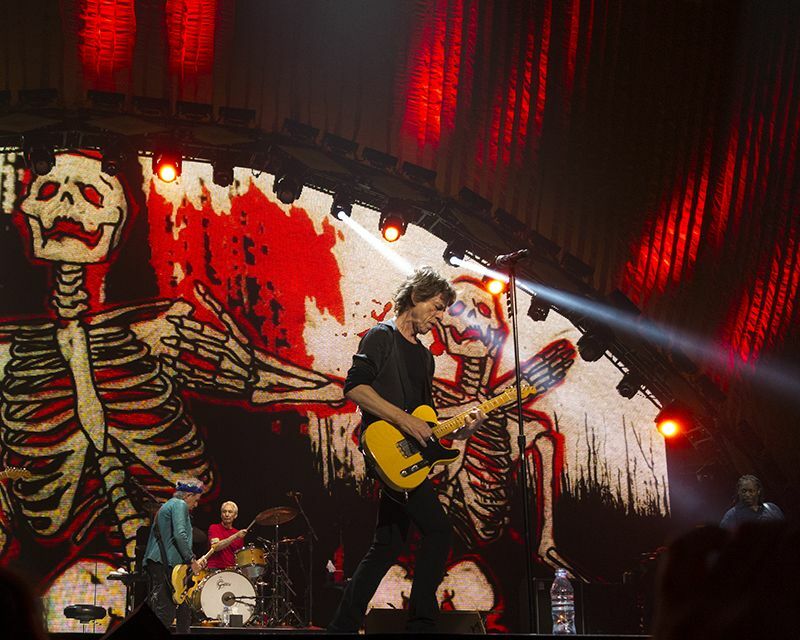 Mick Jagger was in rare form for Satisfaction, and at the end he took it to another level. It seems it lasted a bit longer so Mick could get it all out. And he's about to be 70; they're all around about 70? Fantastic show. Sound was excellent -- very loud and crisp. We are looking forward to a few more shows this tour, and if we're lucky, future tours! Tonight was a classic example of why the Rolling Stones are so interesting and worth seeing on repeated occasions. I spent more than a week imagining what a Chicago show would be like, and the actual show was nothing like I expected. The songs I anticipated to be highlights were perhaps a bit disappointing, and sometimes-too-familiar stretches like Start Me Up and Miss You were lively and entertaining. The United Center crowd did seem less raucous than most of those earlier this month out west, and Mick seemed to have to work the crowd extra hard on It's Only Rock and Roll. Rocks Off (the supposed internet choice) also seemed to lack energy, with Keith more reserved than usual. The slow songs however seemed especially good tonight, especially Wild Horses and You Got the Silver. 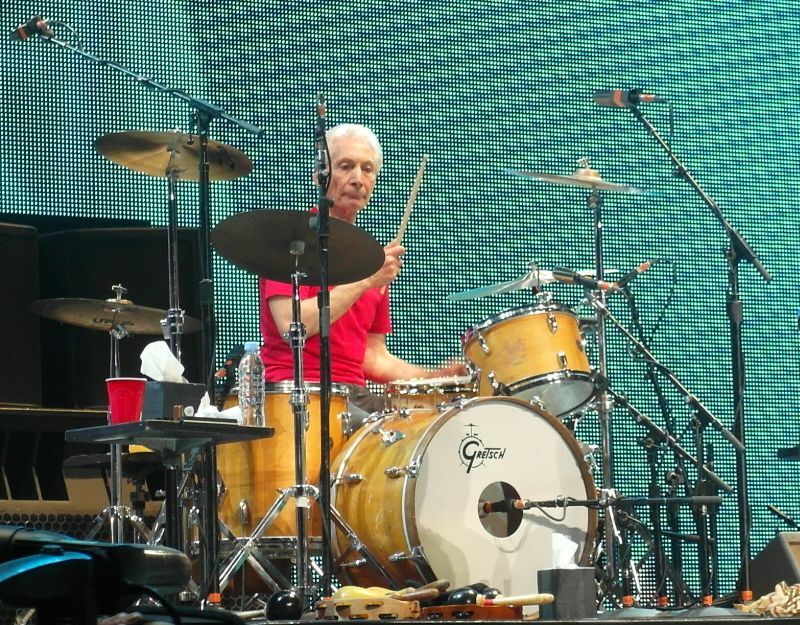 It was great after You Got the Silver when Keith specifically complimented Ronnie Wood on his playing; I do not recall him doing that for quite some time. Emotional Rescue seemed to be the turning point where Keith perked up, amused and amazed to see how Mick handled the song. 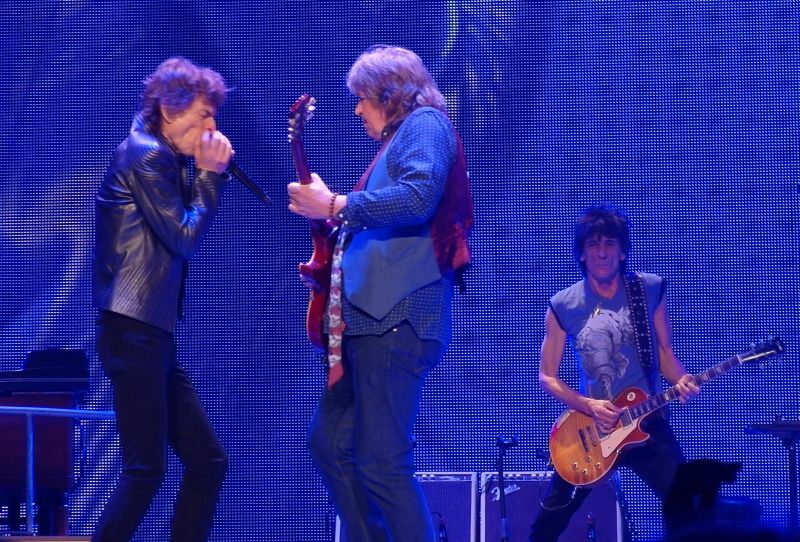 There seemed to be more eye contact, more interaction between Mick and Keith at this show than any other on the tour with a few encounters out on the walkway, and the best yet vocals on the new song "One More Shot", with Mick and Keith singing loudly together and exchanging looks, making it look like the "I love I love I love ya" lines were meant for each other. If I had to narrow down a personal favorite 30 or 40 seconds of an entire show, it would be that vocal part of One More Shot. The special guest was Taj Mahal, which at first was a disappointment as hints on Twitter could just as easily have been interpreted as it being Buddy Guy. What a tremendous thrill this song was, the country classic Six Days On the Road. I had always associated this song with Gram Parsons, as Parsons and his band are even shown singing it as an opening act at Altamont in the Rolling Stones movie Gimme Shelter. Taj Mahal recorded a version in 1969, hence the reason for the selection. What was especially great was seeing Mick perform the vocals on this song, and seeing just how he compared to others that have performed it, including Gram Parsons. With all of the history between the Stones and Gram Parsons, there are few songs by which to directly compare Mick Jagger and Gram Parsons (Wild Horses and Honky Tonk Women come to mind, but it was Parsons doing those after Jagger). Mick attacked this song, and did just a beautiful job with Taj Mahal. It was fantastic to see Mick stay true to the original, enunciating, "I'm taking little white pills (amphetamines) and my eyes are open wide", unlike the sanitized radio hit versions of recent years that clumsily substitute "I'm passing little white lines...". Finally, with Taj Mahal known as a blues man and then doing this song with the Stones, it was a great reminder of how the line between blues and country nicely blurs and how related the genres are. 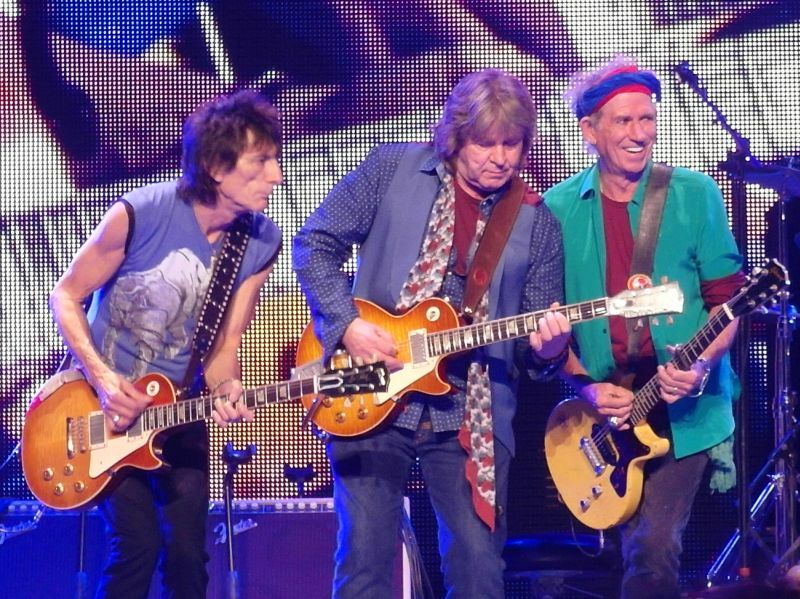 Satisfaction was great tonight, with Mick Taylor nicely audible but Keith earning all of the attention with scintillating guitar that was fast, graceful, and resonated with that sound that along with Chuck Berry defines rock and roll guitar. 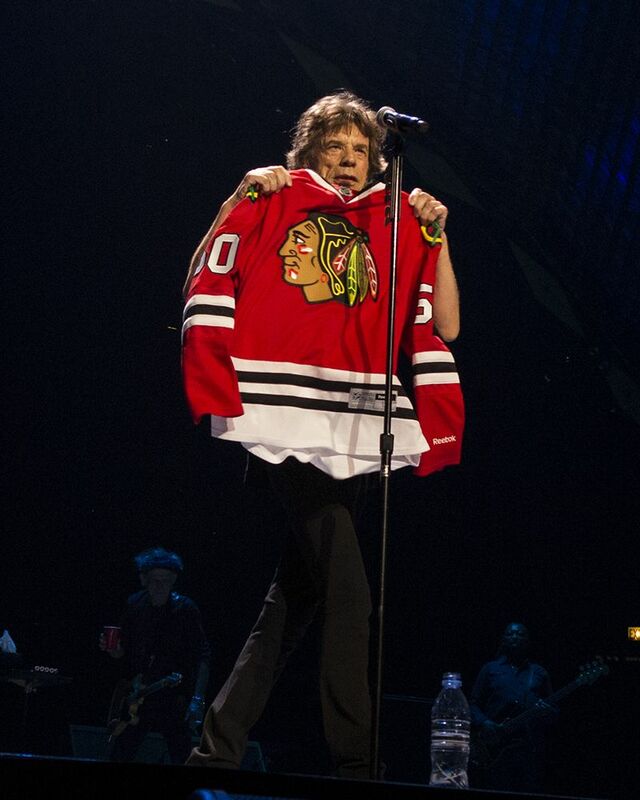 Mick Jagger mentioned the Chicago Blackhawks hockey team, which will be playing Wednesday night in the very same United Center (and if they win Wednesday, again between the second and third Stones shows). He waved around a Blackhawks jersey of goal tender Corey Crawford, yelling "I hope they win!" before launching into Honky Tonk Women. 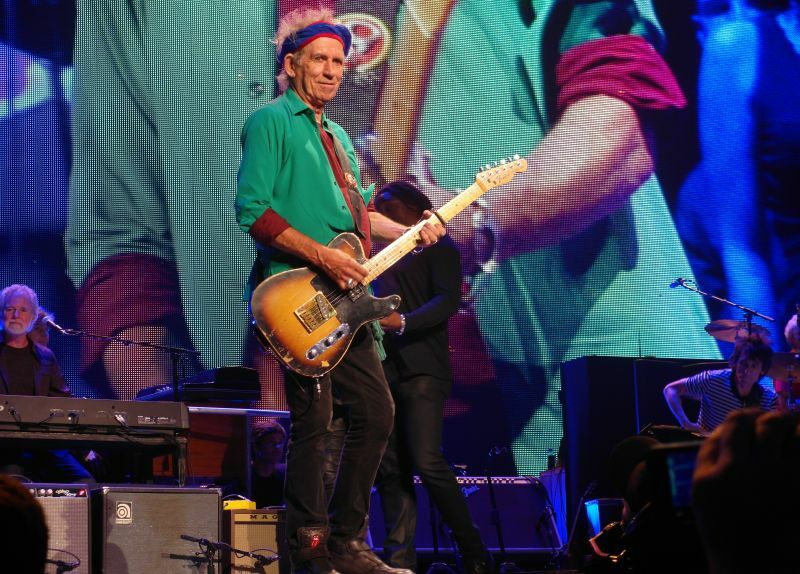 People did seem to appreciate this, but I was surprised at how little Blackhawks apparel was being worn at the Stones considering the overlap of fans and venue. This was the ninth time the Stones played the United Center, and allowed Mick to do some comedy: "They said this is the house that MJ built", in reference to Michael Jordan who played basketball here with the Chicago Bulls, adding, "Then I realized it had nothing to do with me". Still, with that number of shows here over the years, I think in fact the MJ line is valid for more than just Jordan. In ranking the UC shows, I would say this one was superior to those in 1998 and 1999, roughly equal to those on the Bigger Bang tour, yet not as good as the Licks tour show in 2002. With two more shows yet to be added to the United Center collection, it promises to be a great week in Chicago independent of what happens to the Blackhawks when they take their turn at the UC Wednesday night. This was my 16th show but 1st in almost 7 yrs. I had pretty good seats in sec 114 on very left side of the stage near Bernard & Lisa. Having seen them a bunch, ER, Six Days, & the two tracks from Grrr were the only songs I hadn't previously heard live. I would have liked to have heard some of my personal favorites but have no complaints about the set list. Mick was in fine form, imo, and I was really surprised at how well he sounded on ER. Keith & Ron did great on YGTS and I was glad to hear BTMMR. I was most surprised at how much I liked the song with Taj Mahal. Usually I'd rather they not waste time with some random singer but this was a really good song. Having said that, obviously not all of the songs were the best versions I've seen. IORR, GS, & SFTD didn't seem to have the power they once did. Not that they were bad; just not as strong as before. I had a great time and plan to see them again Monday. Some asides: I was inside at the time but it sounded like quite a thunderstorm was going on about 8 or so. My friend and I noticed 4 or 5 security guys walk down to the 5 or 6th row between 113/114 and look around a little after 8. A little later, Nancy Pelosi and some guy sat down in sec 113 with the security guys watching over her. Some guy several rows back bought her a beer or at least tried to. She stayed for the whole show and we saw her being escorted to a private area when we were walking out. I can't remember the song but towards the end of the show, Mick took a water bottle and sprayed the crowd with it a couple times. He screwed the cap back on and threw it towards the back of the stage. He didn't throw it far enough though and it hit Chuck Leavell in the side of the head. Mick noticed and mouthed "sorry" but it didn't slow Chuck down at all. Hours after the Stones in Chicago for the first of their three concerts within the week and I still can't get off of that cloud. The cloud the fans are still on from being sky high after 2 hours and 15 minutes of pure joy. Somehow, time stood still again and all was right with the world. The world that has us fortunate enough to be living during the first 50 years of the Stones' career. Granted, the second half of the show mega-hits set remains unchanged from the December shows in the New York area, but it doesn't matter when they perform the songs with that much energy. 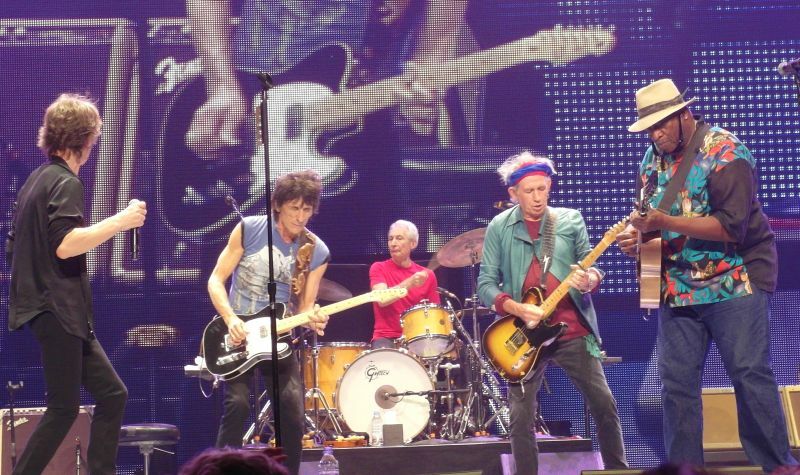 It took a couple of songs for the Stones to hit their groove but it took off from there. 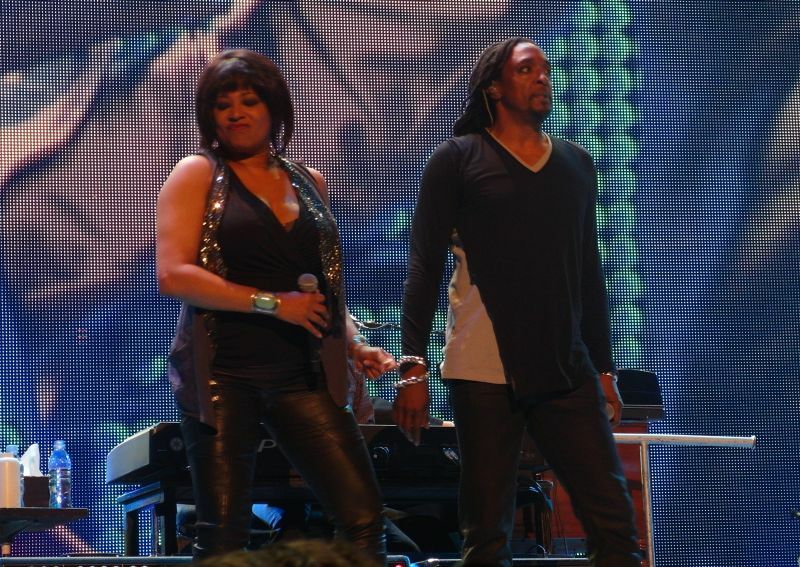 Letting Lisa Fischer handle Gimme Shelter every show (instead of wasting it with a female guest singer) is paying big dividends, as usual. 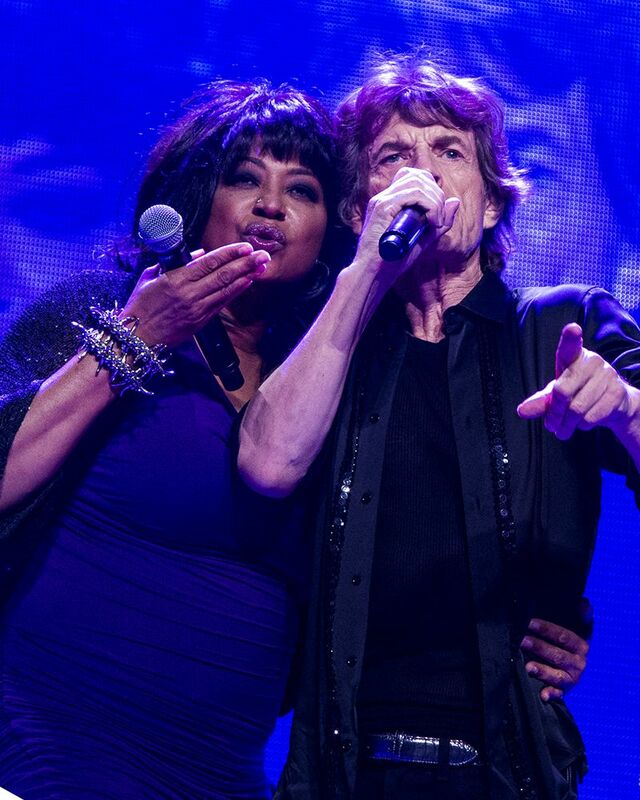 The "romantical" (as Mick puts it) Wild Horses was well done, even better than when I saw it in Newark in December. Next came the "vote" winner, which was Rocks Off. Always glad to see a track from Exile On Main Street, this was my first time seeing them perform it in person since 1994, so I was definitely pleased with the choice. Little did I know there were even bigger highlights to come! Next came Taj Mahal as special guest. We didn't know what song to expect, with the thinking being it would be a Chicago blues type song. To our surprise, Mick introduced "a song Taj recorded on one of his first albums", Six Days On The Road. (Most people know the Dave Dudley country song if they know it at all.) Other than Taj's microphone being too low for the first part of the song, they all totally nailed it. You would have thought that the Stones had done this song live 100 times from the way this one-timer came off. 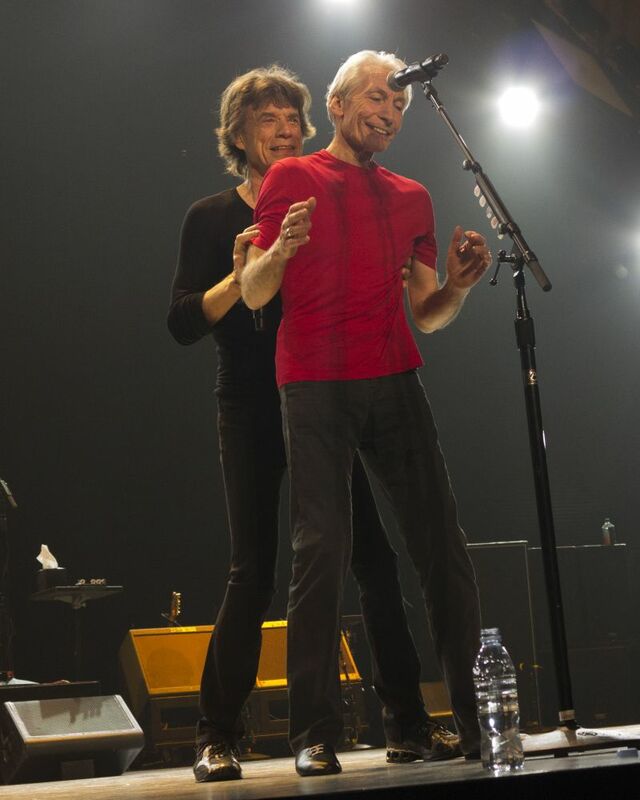 Could well be the ONLY time the Stones will do this, and it was a definite treat! Following that was another song I had not seen live before, Emotional Rescue. (The Stones never performed it live until this past month, and this is my first in-person show of this tour stretch.) What a highlight! Darryl Jones adding a great bass guitar beat and Mick doing the falsetto part without a hitch. And what treat to see back-to-back songs done live for the first time! The next highlight was the Keith set. My first time seeing You Got The Silver since the '99 tour, and Keith did a tremendous job with it. This tune seems to suit the limitations of Keith's voice as well as any song these days. And the passion was there. With Silver and Before They Make Me Run, this was the best Keith set I've seen in years. And then, speaking of highlights, back came Mick and out came Mick Taylor for Midnight Rambler. Again, the absolute highlight of the show! Mick doing extra harmonica parts, extending the "oooooooooh ya!!" part with an enthusiastic crowd, and the entire guitar section in perfect musical harmony. One of those Stones concert moments when you think they could have come out on stage, ONLY played Rambler, left the stage, and I would have considered it a great concert and a worthwhile evening. But there was more. The highlight of the remainder for me was actually an amazingly re-charged version of Satisfaction to wrap it all up. Keith took off out on the tongue stage with an extended and driving guitar solo, and the song was extended with everybody on stage turning it up a notch. 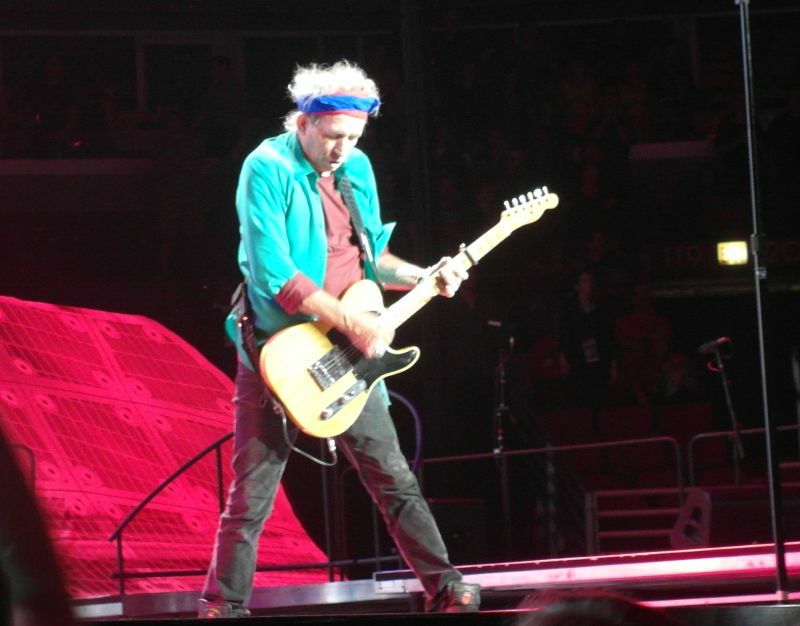 Although the sound was, for the most part, excellent in the United Center, there were a few instances of guitar feedback, which is rare for a Stones concert. 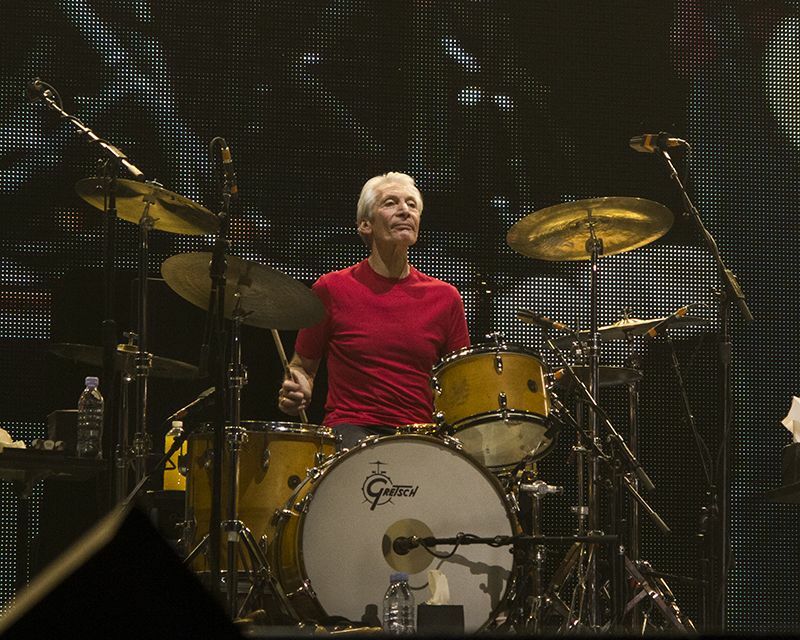 Mick was especially animated and energetic for most of the show, and more chatty than usual. Must be because it's Chicago. Mick talked about playing at McCormick Place in 1965, and at another point talked about the stage coming down for the Blackhawks' 7th game playoff vs. Detroit. 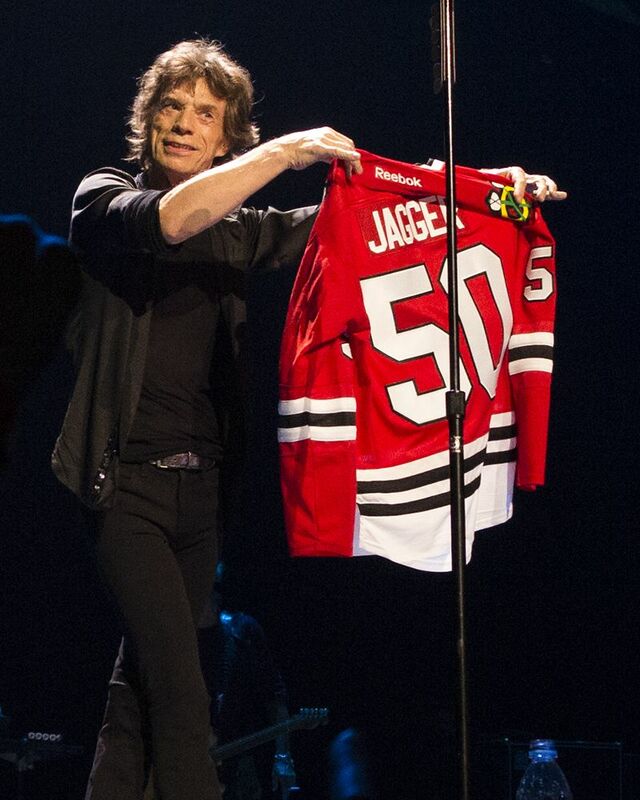 He even held up a Blackhawks jersey that had the name Jagger and was number 50 on the back. As if the crowded needed anything else to roar about!! And now the wait for the upcoming 2nd Chicago show on Friday and the 3rd on Monday. There will be more changed out songs, more special treats, and more importantly, more Stones! !